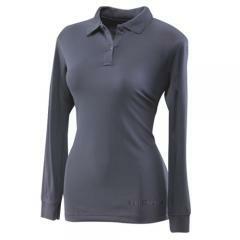 Tru-Spec's performance-driven 24-7 Series Women's Long Sleeve Performance Polo Shirt combines superior functionality with a professional appearance. The 100% polyester jersey fabric is designed to resist picking and snagging. Moisture-wicking properties work to repel sweat, guaranteeing lasting dryness and comfortable wear. The Silver Plus topical finish kills 99% of bacteria and prevents odor buildup. The innovative fabric is also treated with 50+ UPF, offering certified UV protection for extended outdoor wear. A reinforced neck yoke with No-Curl collar inserts offer exceptional durability while maintaining a uniform-ready look. The female-figure centered design includes gusseted sleeves, side vents and an extended back, preserving a full-range of motion in tactical situations and making it easy to securely tuck in the shirt. A convenient microphone/sunglasses holder sits at the bottom of the placket and a two-pencil pocket on the sleeve provides space for writing equipment.